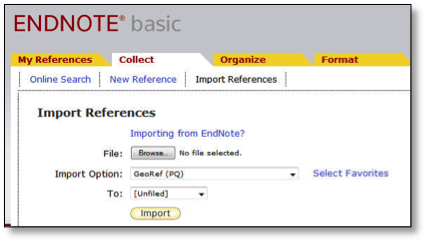 Endnote Basic is a free web-based system for organizing articles and creating bibliographies. This Web-based tool provides users with 2GB of online storage for their references and the ability to instantly format bibliographies in their word processor. 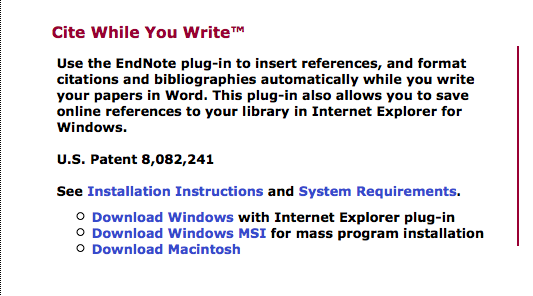 These instructions are for EndNote basic. It is possible to sync citations between EndNote and EndNote basic. 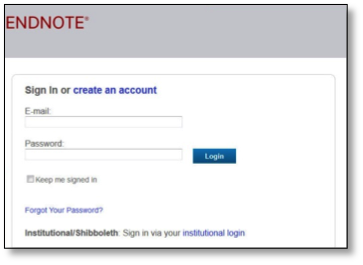 To use EndNote Basic you must sign up for an account. If you have a Web of Science account, that account will also work for EndNote Basic. Once you have established an account you will use the myndnoteweb.com page to access your library. Make sure to bookmark this page in your browser for easy access. You can save citations from many of the Western Libraries databases and import them into your EndNote basic library using a simple two-step process. While in your database, you need to export the selected citations or save the information from the database in either "EndNote" or "RIS" format. Remember what database you search. Once you have saved the data open EndNote Web and click on the "Collect" tab. Click the Import link located under the Collect tab. Click the Browse button in Step 1. This will open a window for you to find and select the import file. Select the database you exported the records from using the Import Option drop-down menu. If the database you used isn't in the list, then select "RefMan RIS" from the menu. Optionally, select the group (or folder) into which you want to save the references. The references imported from the selected file are now saved to the folder you selected, or into your "Unfiled" folder. 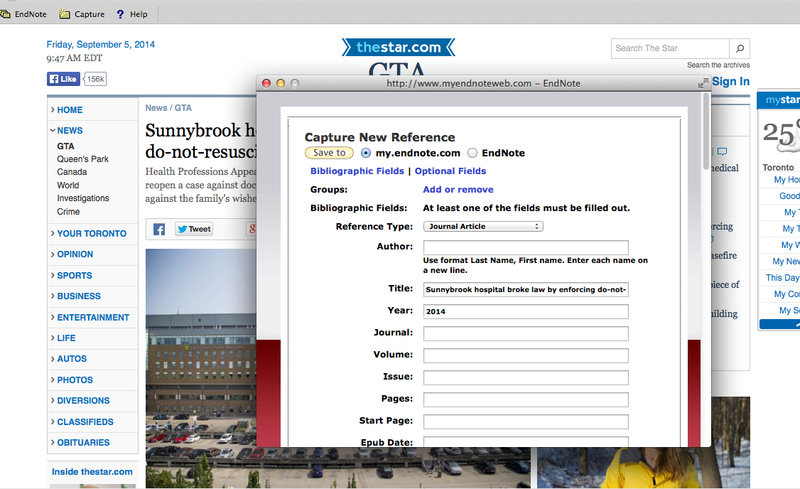 Endnote provides a Firefox browser add-on that allows you to capture information about the webpage you're looking at. This works best when you're reading an abstract of a journal article or a news website. The Add-on is available in EndNote basic under Options tab and Download Installers section. The "EndNote" button takes you to the EndNote website; the "Capture" button lets you add citation information from the page that you're on to your EndNote Basic account. The "Capture" button describes the page you're on, not any citations that are on the page, so it doesn't work with a list of articles in a database. The first time you use the "Capture" button, Firefox will ask you to give your EndNote Basic username and password. Make sure that the information in the "Capture" window is correct and complete, so that EndNote will e able to format your bibliography correctly later. Choose the folder where the reference will be saved from the Choose Folder drop-down list box. Enter the bibliographic data in each of the fields in the reference. Reference Fields required for a properly formatted citation and bibliography are indicated with asterisks. EndNote Basic can automatically create bibliographies and format citations in documents, assignments, manuscripts, and more in a variety of citation styles. Click on the "EndNote online" option, then fill in your account information and click "OK". You are now ready to start adding citations to your Word document. Type a search into the "Find Citation" search box, and the matching articles in your EndNote Basic account will appear. Select one or more of the articles, and click on the "Insert" button (if you are using an "author-date" style and want to change the display, then click on the down-arrow to select how you want to insert your citation). 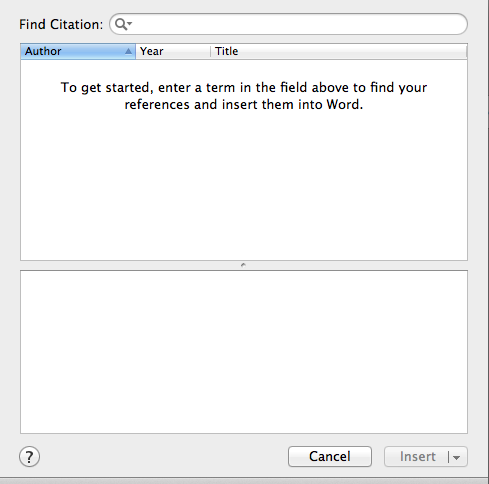 The in-text citation will appear, and the article will be added to your reference list at the end of the document. If this is the first citation you've inserted, then the reference list will be created. To change the way that your bibliography is formatted, click on the Configure Bibliography button in the toolbar. This window lets you change the citation style on the Format Bibliography tab; adjust the font and title of the bibliography on the Layout tab; and enable or disable immediate formatting of your citations and bibliography on the Instant Formatting tab. EndNote Basic lets you create a quick bibliography using the Bibliography section of the Format tab. You can create a bibliography from all the references in one of your groups, or if you just need a few references that you want to post to a blog post or email to somebody, add them to the "Quick List" on your My References tab. In EndNote basic select Bibliography (under the Format tab). Select a bibliographic output style from the pull-down menu (i.e., APA, MLA, etc.). Select a file format: HTML, plain text, or rich text format. Save, email, or print the bibliography. EndNote Basic facilitates the management and formatting of citations. However, it is vital that you check the citation data at the import stage and check the formatting of your in-text citations and the generated bibliography to ensure the completeness and accuracy of the data captured or the references being produced. Check out the Getting Started Guide at the EndNote Basic website for more tutorials. Contact us for assistance with EndNote Basic questions and problems. This work by Western Libraries Citation Management Working Group is licensed under a Creative Commons Attribution 4.0 International License.